SNOWMASS VILLAGE – The Denver Museum of Nature & Science has reached agreements with the Snowmass Water and Sanitation District and the State Historical Preservation Office that will allow excavation crews to return to Ziegler Reservoir in May, the museum announced Wednesday.Museum crews will spend seven weeks between May 15 and July 1 continuing the excavation of “an exceptionally preserved series of Ice Age fossil sites” that were first discovered last October by a bulldozer operator working on the expansion of the reservoir. The district won’t pick up any expenses related to the museum’s work in the latest agreement, according to its board chairman, Doug Throm. Last fall, the district picked up the tab for security and a heated tent at the site. The town government will pay security costs this year, he said.”The discoveries made last fall at Ziegler Reservoir are among the most significant in Colorado history, and having additional time to excavate this spring will further enhance our scientific understanding of this amazing find,” said George Sparks, museum president and CEO, in a press release. 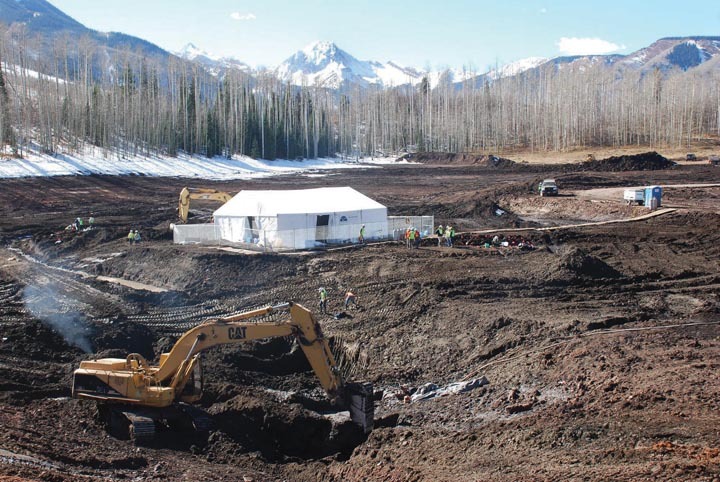 After the discovery of the original juvenile Columbian mammoth in mid-October, museum excavation crews arrived at Ziegler Reservoir near Snowmass Village in early November to begin digging for additional fossils. Over a two-week period, they uncovered an exceptionally well-preserved Ice Age ecosystem that produced a bumper crop of Ice Age plants and animals, including parts of eight to 10 American mastodons, four Columbian mammoths, two Ice Age deer, four Ice Age bison and one Jefferson’s ground sloth (the first ever found in Colorado).By the end of the fall 2010 excavation, museum crews had recovered about 600 bones and bone pieces from the Ziegler Reservoir site, including 15 tusks, two tusk tips, and 14 bags full of tusk fragments from the mammoths and mastodons, plus hundreds of pounds of plant matter. The fossils are currently being preserved in the museum’s conservation lab in preparation for scientific study. The agreement between the museum and Snowmass district, and an excavation permit from the state archaeologist, allow museum crews to excavate in the same area of Ziegler Reservoir where most of the fossil discoveries were made in November. Crews will remove any fossils that are in the ground below the dam construction site. This will allow the district to complete dam construction on schedule without damaging or burying any fossils.The museum expects to have as many as 40 people working at the dig site at a time, including a small number of formal and informal educators from the Roaring Fork Valley who will be selected and trained as volunteers to work side by side with scientists and other museum staff. Go to http://www.dmns.org/digvolunteer for more on applying to volunteer.The agreement also allows the museum to leave a small excavation crew at the site after July 1, as construction continues on Ziegler Reservoir. The crew will recover additional fossils that might be exposed by large machinery as clay is excavated to build the dam. The state of Colorado owns and manages fossils found on state land or land managed by smaller governmental entities including districts such as the Snowmass Water and Sanitation District. The fossils are preserved in designated museums for the benefit of the public. The Denver Museum of Nature & Science is the designated state repository for the Ziegler Reservoir fossils, but is expected to provide a cast of a mammoth to Snowmass Village for display. The museum has assembled a team of 34 scientific experts from 15 institutions in the United States, Canada, and England to study the discoveries. Some members of the science team will be joining the excavation team at Ziegler Reservoir for a portion of the dig. The Ziegler Reservoir excavation site is one of the most important paleontological sites in Colorado for several reasons, according to the museum. They include:• The high-altitude setting of the site (8,874 feet) is consistently underrepresented in the Ice Age fossil record.• The site contains several fossil-bearing levels that allow for the reconstruction of a series of Ice Age ecosystems and potentially a better understanding of Ice Age climate change in the Colorado Rockies. • It is exceedingly rare to discover such a diversity of plants and animals from an Ice Age ecosystem in one place. Normally, scientists must use information from many different sites to piece together a picture of what plant and animal life was like in the Ice Age. At this site, they can assemble a very complete picture from one location.• The preservation of the fossils discovered at Ziegler Reservoir is exceptional. Plant matter found at the site is still green, and at least one of the tusks recovered from the site is still white after tens of thousands of years. Scientists believe there is a good chance of recovering well-preserved ancient DNA from some of the fossils. The age of the site is also of particular interest to scientists. Initial radiocarbon dating indicated the Ziegler Reservoir site is more than 45,000 years old, and geologists estimate the site could be as old as 130,000 to 150,000 years. Discovery of such an old Ice Age site is rare and will provide scientists with an opportunity to learn about an earlier part of Ice Age history, the museum said. DENVER – State Sen. Gail Schwartz along with Rep. Laura Bradford (R-Collbran) and Denver Museum of Nature and Science officials will host a press conference at 8:15 a.m. Thursday at the State Capitol to unveil the fossils discovered last fall at Snowmass Village.Schwartz (D-Snowmass Village) will deliver a resolution to recognize the achievements of the teams involved in the discovery, excavation, preservation, study, and promotion of the Ice Age fossils. “This is truly an extraordinary discovery for the state of Colorado. I am so pleased to be able to bring forward this resolution to acknowledge the outstanding teamwork in managing the discovery site and ongoing preservation and study of this important find,” said Schwartz, a Democrat who lives in Snowmass Village. Schwartz was appointed to the “Tusk Force” based on her role as a resident of the Roaring Fork Valley for over 40 years and her representation of the area as a state senator since 2006, according to a press release.